From simple backup power to stand alone emergency systems, we offer a range of maximum power output and power system run time. The rated output of the inverter determines the maximum power and the size of the battery bank determines the system run time. And if you need something different than what you see here, we can build a system to your exact needs! The BPS Systems are inverter/charger, battery based power systems designed to keep critical circuits powered in the event of a utility power failure. The batteries are kept fully charged by utility power when power is available. 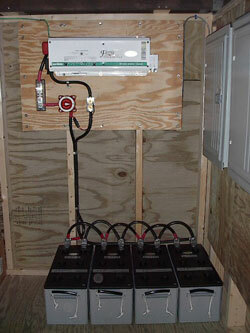 When the power drops out, the inverter automatically transfers those critical circuits to battery power. When the utility power comes back on, it automatically switches the loads back and recharges the battery bank. In short, the system is designed to automatically keep your critical circuits live, when utility power fails. The AGM batteries that we provide in these systems are completely sealed, so no spillage can occur! Because they are sealed, there is no explosive hydrogen gas given off and there are no water level checks as with flooded batteries. Also, since they don't gas, there is no corrosion build up on the battery cable or terminals, making the entire system completely maintenance free and safe to have located inside the home. Concerned about how to wire all of this up? Well, dont be! Hamilton Ferris Co can professionally pre-wire & board mount the components that make up these systems. This service will dramatically streamline your installation time. When you recieve your order, you simply hang the board on an interior wall, wire the batteries together, connect the inverter cables to the batteries & connect your critical loads to the inverter. That's it! The fee for this service is shown below. 1500W for 3 Hrs, 750W for 6 Hrs, 375W for 12 Hrs, etc. A critical load backup power system designed to allow basic services like lights, refrigerator, microwave, entertainment, computer, etc. to operate during shorter power outages. SO WHAT DOES ALL THAT REALLY MEAN TO YOU? It means that you: Can run your furnace for 8 hours, run your refrigerator for 8 hours, use 4 X 60 watt lights for 4 hours, watch TV for 3 hours, use your microwave for 15 minutes and still have additional battery power remaining! 2400W for 3 Hrs, 1200W for 6 Hrs, 600W for 12 Hrs, 300W for 24 Hrs, etc. The same type of critical load backup power system as above, but with a battery bank almost 250% larger and 60% greater inverter power. Using this powerhouse means that more appliances can be operated at one time, or the same loads can operate for a much longer time period. SO WHAT DOES ALL THAT REALLY MEAN TO YOU? It means that you: Can run your furnace for a full 24 hours, run your refrigerator for a full 24 hours, use 4 X 60 watt lights for 4 hours, watch TV for 3 hours, use your microwave for 15 minutes and still have additional battery power remaining! IS WHEN YOU DON'T NEED IT! DON'T WAIT UNTIL IT'S TOO LATE... ORDER YOURS TODAY!